525 whp Performance Package on the Dyno with Tapout Tuning! 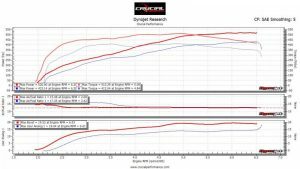 We did our pulls at Crucial Performance, our favorite dyno location where all data is precisely calculated using SAE correction factor and smoothing=5 so we know true horsepower and torque figures this ATS-V is making. It is important to us that we have the most accurate information possible when making the final adjustments to our tune. After making the necessary changes and edits and with 93 octane pump gas in the tank we picked up 93 whp and 101 wtq! Air/fuel ratio is rock solid at 12.5:1 and boost averages a conservative 18 psi. Let’s just say this ATS-V is now running like a bat out of hell, ready to take on the next competitor on the street or at the track. The combination of aftermarket parts included in this performance package is a great way to take your ATS-V to the next level and set yourself apart from the crowd! To see how you can make these kinds of power gains in your ATS-V take a look at our performance packages we offer below!